Jenny wants to be able to celebrate her ruby anniversary with the man she loves, but for forty years she has kept a secret. A secret that she can't bear to hide any longer. But is it ever the right time to hurt the people closest to you? As the entire family gather to toast the happy couple, they're expecting a day to remember. The trouble is, it's not going to be for the reasons they imagined.. 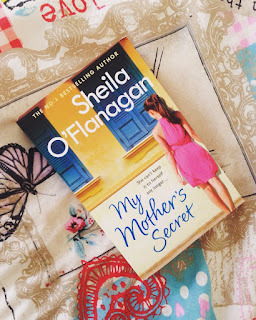 I'd never read a novel by Shelia O'Flanagan before so was rather looking forward to reading this as soon as I received it. The concept behind this novel intrigued me and I was also drawn in by the beautiful cover art (which is even more stunning in real life, trust me). My Mother's Secret follows the story of three siblings Steffie, Roisin and Davey as they plan a surprise ruby wedding anniversary for their parents, Jenny and Pascal. With family and friends all gathered around it should be one of the best surprises of their lives, that is until the secrets start coming out. I will admit as I was reading this novel reminded me of a soap opera in some ways, but that was fine by me as I am a lover of all things soap. It was also different for me to read a book set over a few days and that included a large family unit. I don't think I've read a book like that before, so it really did stand out. I could imagine all of the different family members vividly in my head and at times it was like I was there amongst all of the chaos, action and drama. The secrets that spilt out during the book were slightly predictable and I had an inkling of what they were going to be before I even got to the part where they all came out. Despite this, I think they were handled by the characters in a unique way, which stood out and kept me hooked. I found myself feeling majorly sorry for Steffie at one point, but then a few pages after I found myself switching sides and feeling sorry for Jenny. I have a feeling that's what the author wanted you to feel like. They wanted your emotions to run away with you and that's what happened with me. Whilst reading my emotions were all over the place. I was happy one minute, angry the next and then crying a minute later. My Mother's Secret was an emotional yet heart-warming read, which kept me hooked to a point where I didn't want to put the book down. The genuine plot may have been a little predictable but that doesn't change the fact that it was honestly one of the best books I have read so far this year. I will definitely be looking up more of Shelia O'Flanagan's work.